Sunday afternoon (March 13, 2011), St. Andrew’s Episcopal Church in the Highland Park neighborhood of Pittsburgh held the first parish forum that I know of on the Anglican Covenant in our diocese. The program was called “The Anglican Covenant: Point–Counterpoint.” It was a presentation by two Pittsburgh priests espousing pro- and anti-Covenant positions, followed by a question-and-answer session. It was attended both by St. Andrew’s parishioners and a smattering of Episcopalians from other churches. St. Andrew’s is actually doing a fine job of educating its members. 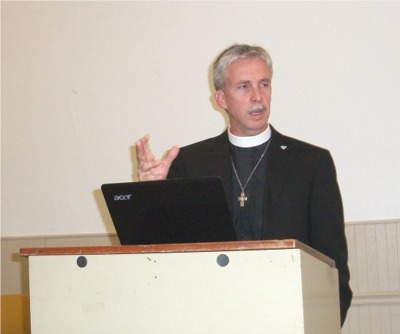 The parish sponsored a series of talks in the fall on Anglican history, and Sunday’s presentation had been preceded by a session on the content of the Covenant. A future session will be a discussion of the Covenant among the members of St. Andrew’s. The Rev. Bruce Robison introduced the presenters, explaining that they had informally been calling the debate the Clash of the Titans. This got a bit of a chuckle, though the afternoon was a good natured discussion and not much of a clash at all. Taking the pro-Covenant position was the Rev. 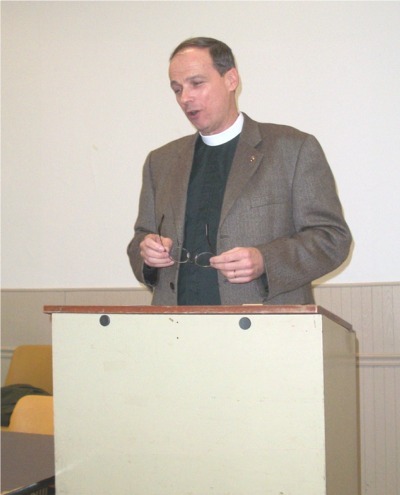 Bill Geiger, rector of Christ Episcopal Church in Indiana, Pennsylvania. Representing the anti-Covenant position was the Rev. Nate Rugh, curate at the nearby Calvary Episcopal Church. Each presenter was to speak about 15 minutes. Geiger went over his time allotment, but Rugh managed to say what he wanted to say in a quarter hour. This worked fairly, however. Geiger summarized the content of the Covenant. This was, in the context of the programs at St. Andrew’s, technically unnecessary, but it was probably helpful, even if it took a while. (St. Andrew’s had copies of the Covenant available to the audience, though not much use was made of them.) Geiger spoke in an informal manner from notes, whereas Rugh, who wanted to cover a lot of information in a short time, read from a prepared text. He did this well, and his style kept listener interest, but he did speak rapidly. Geiger noted that his church also has done a study of Anglican history and is about to embark on a three-week Covenant study. He noted that he is probably more conservative than his congregation, since Christ Church lost a number of families in the 2008 diocesan split to the diocese now headed by Archbishop Robert Duncan. Both St. Andrew’s and Christ Church are models of how to conduct Covenant discussions. Geiger admitted that the Covenant is probably not up to the usual literary standards of Anglicanism. Reading it, he said, “is like swimming through molasses.” In any case, many in the Global South find the covenant too weak, and many in the West think it too strong. It makes people on the right and left mad, he asserted, which suggests that it just might be all right. In its currently polarized state, it is difficult to compromise, to see value in opposing positions. Our via media tradition does not require opponents to “kiss and make up,” he said, but The Episcopal church had not really listened to what other Communion churches had been saying when it decided to make Gene Robinson a bishop. (The Covenant grew out of the Windsor Report, which was created in response to the Robinson decision, though there is nothing about sexuality in the Covenant.) The Covenant, Geiger asserted, is designed to strengthen relationships by having churches make promises to one another. Geiger said that the first three sections of the Covenant cover no new ground. Of course, the role of the Standing Committee to rule on disputes and recommend relational consequences is new, but the Instruments of Unity can act now, even in the absence of a Covenant. Do we need the Covenant? Geiger said that he though it would be helpful. He introduced a family business as the central metaphor of his talk. Families, he said, do not kick members out, but they can grow apart. He introduced the idea of a European family business making gear for mountaineering. Then family members move to other countries, in Africa and America, say, and begin making sporting gear for the markets they find there. The U.S. branch of the family begins making clothes for beach volleyball, and the German branch objects, saying that it tarnishes the reputation of the family business worldwide. The analogy is obvious, and there needs to be a way of dealing with such disagreements. The Covenant provides a way of talking through disagreements, Geiger asserted, and, it is to be hoped, keeps the family together. Rugh declared that he was against the Covenant because it would change the nature of Anglicanism. It would, he said, damage the thing it was designed to save. He then listed three effects of the Covenant that would forever change Anglicanism: it would change our polity, change our relationships, and change the way we do theology. Citing the origins of the Church of England and The Episcopal Church, Rugh asserted that Anglicanism has always claimed that “locality and particularity” are essential for Catholicity. As the Communion grew, autonomy has always been an important principle, one to which the Covenant pays lips service even as it undermines the concept. Whereas the Communion, under the Covenant, does not make churches do or not do anything, the threat of relational consequences will make the demands of other churches hard to resist. Not only is power centralized under the Covenant, Rugh said, but that power is largely wielded by bishops and Anglican Communion Office bureaucrats, which diminishes the role of ordinary laypeople and rank-and-file clergy. Rugh noted the cognitive dissonance in the juxtaposition of “explicit and forceful” and “bonds of affection” found in the Windsor report. He, too, pulled out a family model, suggesting that families do not sign contracts and create second-tier members. He suggested that the Covenant would actually weaken relationships between churches, but his most interesting argument was that it would weaken relationships within churches by encouraging unhappy members to appeal to Communion authorities rather than working out differences internally. Rugh quoted former Archbishop Michael Ramsey to the effect that Anglican theology is not a particular system or confession, but a tool to pursue understanding of our relationships to God and our neighbors. Such a concept of theology is messy, he said, but has served us well. The Covenant, however, will “trade away our birthright” by setting up the Standing Committee, not the Bible, as the ultimate authority in Anglicanism. In closing, Rugh noted that he had presented the conservative case against the Covenant, because he thought agreement would most easily be found there, but that he could have made more liberal arguments (about how the Covenant hurts LGBT people, for example). In the period following the formal presentations, Robison asked people to formulate questions that could be put to both presenters, not just to one or the other. I began by asking if the Covenant will actually work. I suggested that Sections 1–3 set out what we are going to fight about, and Section 4 tells how we are going to fight. Geiger replied first, never quite giving a reply in the affirmative. The Covenant would provide a way of working through disagreements, he declared. Making commitments to one another is not a bad thing. Most importantly, he said, the Covenant might “reignite a sense of connectedness” and assert the need to consult. The Episcopal Church, in the case of Gene Robinson, did not seem to care about other churches. Rugh’s answer was a definitive “no.” He indicated that he really had no problems with the first three sections of the Covenant. Church actions would be measured against the Bible, the ultimate standard of faith, and the Standing Committee would make definitive judgments on theological issues. This, he said, would be a fundamental change in Anglicanism. The next question was actually more of a statement about the Communion. The speaker said that he thought there was value in the Anglican Communion, even though it has not been working well of late. If the Communion is defined by a formal set of relationships, there need to be common principles and values, membership criteria, rules for how it works, and a system of dispute resolution. The Covenant tries to address all those things. He cited Paragraph 3.1.2 as an ideal description of how the Communion should work. He said that he didn’t understand the threat of the Covenant if the Communion is going to be more than an “umbrella term” for a group of churches. Rugh responded by saying that neither speaker was dissing the Communion. He said he feared the Covenant would harm the Communion. While saying that it is intended to strengthen relationships, the Covenant puts legalistic structures in place that will break down mutual affection. We already have shared principles (the Chicago-Lambeth Quadrilateral); we have shared ways of doing our mission (the Five Marks of Mission); we have ways we have agreed to be together (the Lambeth Conference, etc.). Rather than offering a way of resolving differences, Rugh said, the Covenant confines how we can work toward resolution and profoundly changes who we are. Geiger admitted that things would operate differently under the Covenant., but he denied that it “would profoundly change how we operate as a Communion.” In extended crises, techniques that have worked in the past may no longer work. That is the situation in the Communion now. He said he thought the Covenant would force serious conversation, and that the resolution process of Section 4 would not easily allow one view to be imposed on the Communion. The next “question” was also more of a declaration. The speaker noted that, whereas many primates won’t even take communion with other primates, there are still very strong relationships “on the ground” across the Communion. He cited relationships between Episcopal dioceses and churches and their counterparts in provinces supposedly in impaired communion with our church. The Covenant, he said, puts all its emphasis on a level that is already dysfunctional, whereas lower levels of the Communion are working well. Rugh said that the hope for the Communion lies not in the Covenant but in the Indaba-type listening process begun at the last Lambeth Conference. He spoke of bishops reading scripture together, speaking to one another, forming bonds, and finding ways to disagree and still be in relationship with one another. Geiger admitted that there are many examples of people working across provinces in impaired communion. Nevertheless, he said, disputes are affecting facts on the ground. The next questioner asked what difference it would make if we rejected the Covenant. We would still be in the Anglican Communion, she said. 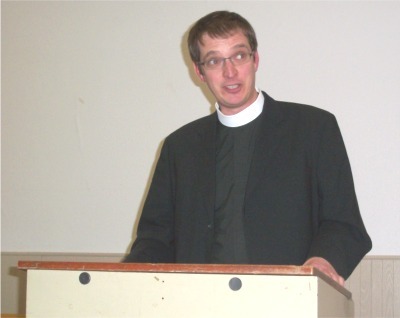 Rugh talked about the Archbishop of Canterbury’s remarks about second-tier status, saying that if that was analogous to the current relationship between the Church of England and the Methodists, that would indeed be a greatly impaired relationship with respect to those churches that had adopted the Covenant. He said he would reluctantly accept such a status for The Episcopal Church. “I think it beats the alternative,” he declared. Geiger said that we have to ask if we value Communion relationships enough to proceed differently than if we did not care. At this point, Robison broke in to ask about possible Anglican futures. Something is going to evolve over the next few years, he said. There are more than two possibilities. The Covenant could be adopted by most of the Communion churches, or by only a few of them. In either case, we could adopt it or not. Isn’t a two-tier Communion almost an inevitability? What are the implications for The Episcopal Church if some churches adopt the Covenant and some do not? Rugh said that he did not have a firm answer on whether The Episcopal Church should sign on to the Covenant if most other churches do. We could say that we will not sign because we think it compromises Anglicanism, or we could sign and accept any relational consequences meted out to us with our heads held high. His preferred outcome, he said, is for Covenant adoption to not gain steam and therefore have little effect. Geiger, on the other hand, said that the least favorable future is the one in which the Covenant goes away—Rugh’s best hope, apparently. Rugh quoted Bishop Saxbee’s remark about favoring the Covenant discussion as long as it never ends. The next questioner said it is also important how we treat people in our own church. He cited the case of Gene Robinson. We would have denied relationships among our own people, he said, had we not allowed the people of New Hampshire to choose the bishop they wanted. Rugh agreed with this, and said that it is unfair when people say The Episcopal Church is simply going its own way. Geiger said that we have been consumed with the sexuality debate, which is easier for us to have than for some other provinces. The issue is about us, but not only about us. Rugh said that we have been trying unsuccessfully to have a conversation about sexuality with the rest of the Communion for 30 years. He cited the maneuvers that led to Resolution I.10 at the 1998 Lambeth Conference and the distorted “history” in the Windsor Report. Before Resolution I.10 was put forward, a long report was on the table that better reflected the diversity of opinion on sexuality within the Community. Robison then essentially called time and invited people to partake of the refreshments, but not before saying that conversation enriches us. Someone in the audience suggested that the kind of discussion we were having represented the best in Anglicanism. I think only a few comments are in order. First, I hope that more discussions like this one will be taking place in the Episcopal Diocese of Pittsburgh, in other Episcopal dioceses, and indeed in dioceses all over the Communion. Not all issues were fully aired. I think Rugh’s points were important ones, but, as he indicated, there were more liberal arguments that could have been articulated. Likewise, there was no discussion of whether the particular processes of Section 4 were really the best way to negotiate differences. I suspect that Nate Rugh was a bit pessimistic. I suspect that Bill Geiger was exceedingly optimistic. At this juncture, there seems to be widespread agreement that the Anglican Communion is in disarray. In order to believe that the Covenant will actually result in reconciliation, one has to believe that the churches most deeply involved in the sexuality debate will be willing to change—or at least suppress—their beliefs. 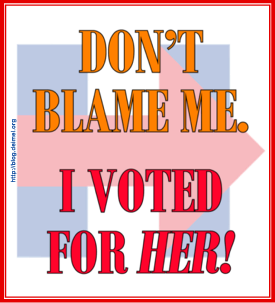 Not only do I believe that that won’t happen, but also I believe that it is unconscionable to ask for it. I'll also chime in to say thank you, Lionel. A good summary and overview of the event. And I agree that while we didn't find consensus or break new ground, it was a helpful conversation. What sort of family is it that needs a contract and a judicial proceedings process to "keep it together." La Costra Nostra comes to my mind. Why Is Rowan Such a Disappointment?